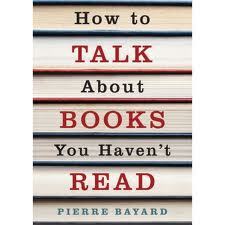 BOLD MONKEY: BOOK REVIEW: Pierre Bayard How to TALK About BOOKS You Haven’t READ. Granta Publications. London 2008 (185 pages). BOOK REVIEW: Pierre Bayard How to TALK About BOOKS You Haven’t READ. Granta Publications. London 2008 (185 pages). This clever, intellectually tricky book will become a classic in post-modern literary criticism. Professor Bayard’s thesis is that ‘it is sometimes easier to do justice to a book if you haven’t read it in its entirety- or even opened it.’ His position is that being cultivated is a matter not of how many books you have read, but rather to understand their place in our culture. He controversially states that ‘skimming books without actually reading them does not in any way prevent you from commenting on them.’ He believes the reader can absorb the ‘depth and richness’ of a text within ten minutes without getting lost in the detail. The biggest loss in reading a book word for word is you will ‘vanish into other peoples’ books and you will be unable ‘to create any work’ of their own. Ironically, it is through the close reading of Musil, Valery, Eco, Montaigne, the film ‘Groundhog Day & others where Bayard develops his brilliant arguments. Most fascinating and hilarious are his analysis of the anthropologist Laura Bohannan’s stay with the Tiv tribe of western Africa. She learns that even though the tribe has never read a line of Shakespeare’s Hamlet the locals find themselves fully capable of discussing and debunking Western notions of the text. Bayard sees reading as a complex and fragmentary activity. Once we have read a text forgetfulness immediately sets in transforming the book ‘to a few approximate pages, into dim shadows gliding along the surface of our consciousness.’ Therefore, a discussion ‘is less about a book itself than about a fragmentary and reconstituted object’ from our memory, or our ‘inner library’ of books we have read. I am impressed that Bayard has students who can discuss books they have never read. They must be a bunch of pretentious wankers! They remind me of revolving-door politicians who try to explain policy they have never mastered. Pontiffs who have never seen past this life. His theory of reading is highly original but deeply flawed. Bayard ignores discussion of the reading process as an end in itself. There is great satisfaction to be savored, of course, in reading a creative text in depth and discovering its many layers and interconnections. If you are always skimming what eventual understanding of anything of profound worth will readers ever have?